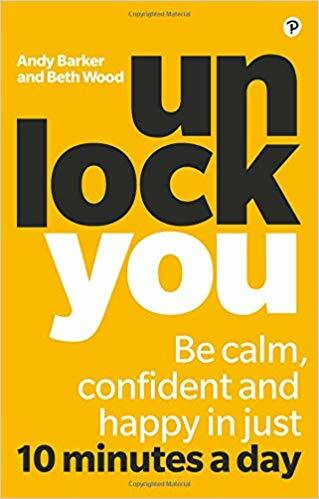 By @SimonCocking review of Unlock You: Be calm, confident and happy in just 10 minutes a day. Available from Amazon here. Unlock You is a special programme designed to give you the skills and tools to be calmer, happier andmore confident. When challenging situations arise you will be able to deal better with them, and cope in a crisis. This unique and easy to follow programme gives you a host of simple techniques and exercises to beat stress and negative habits, and release potential beyond that which you knew you had! Designed to fit easily into your daily life, you’ll quickly learn how to step out of your own way. Using mindfulness, emotional intelligence, CBT and the latest findings from neuroscience, this book doesn’t just change the way you feel but the way you act and react. By building the programme into your daily routine you’ll be a better partner, parent, friend, employer and employee. As more and more of our working world and daily lives become more tech related and often automated the challenge grows of how do we remain in touch with that part of us which is human. Some might say this is unnecessary, waffle and fluffy new age notions in our modern world. However at the same time it is easy to spot the signs of people burning out, having meltdowns, going rogue, trolling others. At a normal, physiological level there are many studies suggesting that we need to learn how to breathe better. Even something as simple as breathing, and as essential to our daily, continued existence is something that we are rushing, snatching at, and not doing deeply or as well as we could be doing. It is part of the ongoing contradiction that, while we may wish to spend all day in our smartphone cocoon, we, as humans, still need to learn a lot to ensure that we look after our physical manifestations, our bodies, just as much, and actually much more than our digital and online avatars. This book does a good job of explaining why this is important, and then breaking it down into simple, actionable steps to try and regain our own humanity and an awareness of what it means to be human. For several years we have wondered why the Dublin event Pendulum, has done so well, with it’s blend of business and spirituality, but with books like this, you can see why there is still value in working on our mindfulness and our place in the world, with our children, partners and friends around us.